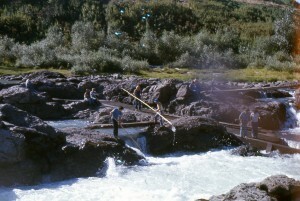 These pictures are from a collection of slides that date to 1971. 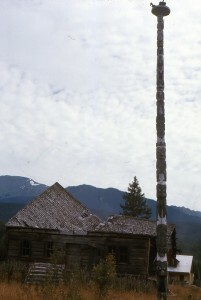 We have pictures of a glacier falling into the sea, and a ruined building with a totem pole next to it. I have no idea where exactly these pictures were taken. I believe these pictures are of the Columbia Glacier. “The Columbia Glacier is a glacier in Prince William Sound on the south coast of the U.S. state of Alaska is one of the fastest moving glaciers in the world, and has been retreating since the early 1980s. 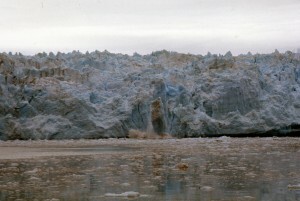 It was named after Columbia University, one of several glaciers in the area named for elite U.S. colleges by the Harriman Alaska Expedition in 1899. No clue where the totem pole is.